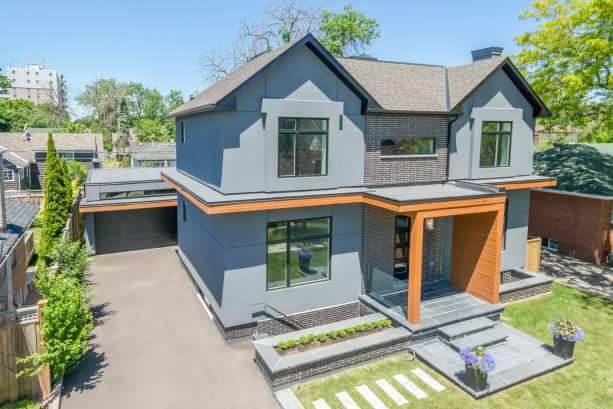 Modern custom home in trendy Central Oakville. One-of-a-kind for the area. This 4 bedroom home has high quality finishes and is loaded with features. 10' ceiling height on main and upper levels, 9' in lower. 7 1/4" baseboards throughout. Wire brushed ash hardwood floors. Beautiful glass staircases. 5 gorgeous baths. Big Pella windows. 8' solid core doors. Double detached garage. 2 Master Bedrooms - one on the main level and one upstairs. Both have walk-in closets, complete with organizers, and 3-piece en-suite baths with heated floors, custom vanities and glass showers. Gorgeous high end kitchen with high gloss white cabinets, chrome hardware and soft close drawers. Herring bone glass backsplash and white Caesarstone counter tops. Eat in area has built-in bench. Great room has gorgeous built-in cabinetry and natural stone surrounding the gas fireplace. Lower level has separate entrance with unique walkup to the front of the home. This area is very bright with big windows and high ceilings. Multiple uses here including an ideal place to work or an in-law suite. Upper level landing has bright open space with skylight. Second level laundry. 3rd and 4th bedrooms both have double closets and en-suite access. Quaint den area as well. Landscaping front and back. Flagstone walkway and flower beds in front of the home. Cedar deck off the back. Great quality build by BASK Construction. Superb lifestyle opportunity awaits as you can walk to everything including the GO station, downtown and steps to trendy Kerr Street.